But, I have no prank to play! I think this is the first year that I'm not playing some silly on someone. But, the day isn't over. Perhaps I'll think of something! I am enjoying the thread that I started on the board about memory making lures. My specific intent was to talk about lures handed down the generations. Some of the posts brought tears to my eyes. I just really enjoy every entry! Click on this thread to read. "Handed down Fishing Gear." That's why when I read Stan's new April column, I was rather surprised! It's title is "Some Lures Are Memory Makers"
It's a great article and I really enjoyed it, also. I guess it's these winter months that linger on, (even though it's Spring) that cause us all to open up old tackle boxes and remember! Oh! I had the most beautiful, bright, big steelie on yesterday for the first time in ages! Second cast! I think that it's funny that Mark's jigs are called "First Bite". They used to be called "First Cast". Both are great names. I think that jigs just produce first bite fish. They pick off the easy fish. I'm not sure they hunt so much, like a drift rig. If there is a fish out there, chances are that they'll take a jig, right off. Anyhow, I lost it just as fast as I caught it, but it was fun for the 20 seconds I had it on! I whoo hooed and hollered and realized, as I always do when I have a fish on, just why I fish! It's the same rush you get when you hit a jackpot on a silly slot machine! Fishing is a gamble, and when you win, you win big! -even if you don't land it! At least for me. I could care less if I land it. That always bugs Bill, but not me. The quest is best, and second to that, the bite! The only great part of landing a fish is that you get an up close and personal encounter. I do love that! But, definitely, my abs fav is the hunt first, and then the bite. The hunt is the purpose, and the bite, the prize! So, as far as I'm concerned, I had a totally successful day out there, yesterday. I could have asked for no more. I even saw the fish and it was huge and silvery and my heart is beating faster, just thinking of it! Today, the hunter in me is all the more predatory. I have to hook him again. Either that, or his dear wife. I'll take either one- or both! So, I guess I do have a prank to play. Naughty me, it's a prank on a fish. C and R.
After a short but fierce battle-- April Fool's! I'm lettin' ya go! Gamoogle. zzzzz. It's really early, outside at 5 in the morning! Why does my hair gal make 7 O'clock appointments? I woke up this morning and for the first time, read this thread. That'll get your brain confused in the morning! Still, it made me laugh. Ever had Dunkin Donuts coffee? It really is pretty good! Nobody spends that much on coffee, though, do they? Opes. I just did! I had to try it! 10 days and counting, until my real vacation. I can't wait. I'm so afraid, though, that I will become spoiled and never come home. :) Good thing that they don't have fishing in Palm Springs! I can't wait to get my hair done. I am turning more and more gray with each new grouchy thread on the board. LOL. Times are tough, and it's showing in people's frustration on the board. Hey! That's frustrating! I think I'll start a thread. Guys, I'm not awake, yet. I think I'll go to my appointment! See ya in a bit. Stan's column is up, by the way! Always a great read! Don't miss it! Click here! Heard of RSS feed but don't know what it is? Here's a great tutorial on it. Woo hooo! Who is excited about the sunshine! I am! I am! "It is not enough to fight for the land; it is even more important to enjoy it. While you can. While it's still there!!!!" So, get out there! I am going to! See ya at the Steelheader's banquet, tonight! Woo hooo! Who is excited about the sunshine! I am! I am! I had to make a new ifish discussion board logo with the sunshine that came over the mountain, this morning! Isn't it pretty!? The sun? Edward Abbey says to all of you that work so hard on our fisheries to get up from that desk and go outside! Do you know? I get lots of e mails of admiration for the way I handle being ill. I don't get it. What am I supposed to do? I don't find it at all remarkable. I'm not in this alone. Not only do I have my Heavenly Father, but I have the love of all of the ifishers, and all of the people in the world! Likewise, I experience their pain, when they have it. I see struggles in each and every one of my friends, and there is no way I see any of their joy or pain, greater or less than mine. Thank God that I am able to share in their joy, and that they help carry the burden of my pain. Every person I'm lucky enough to meet, contributes to a sort of balance in my life. It makes me whole! I cannot imagine having to do this on my own. I don't understand how people have the strength and courage to live life without having faith and God in their lives. To me, God is a strong connection between us all. I can't imagine if I had nothing to look forward to after death, how I'd feel about my life. How depressing it must be! My Father is my almighty healer, and not only for me, but for everyone! Isn't that awesome? Makes me smile, every time I hear it, say it, think it! And, don't ever be afraid to ask for healing! It is our gift! It says of healing, over and over- "Let it be done for you according to your faith" [St.Mathew 8:13]. Sometimes I think people think of healing in such simplistic terms. Not that it doesn't happen, but some think of it as making a blind person see, or a disabled person walk. I think of healing in much broader terms, -like being able to handle my physical shortcomings with joy, or offering someone else a more optimistic outlook on their pain or suffering. That, to me, is healing. The other day I was in the store, and noticed a young woman that had lost a remarkable amount of weight. She told me of the diet she was on. It touched me so much, as I had been on the same diet! "The Stress Diet". She recounted the horrible stress she was under, and it was so like what I had once experienced in my life. I could only listen as she recounted divorce, cancer, pain, pain, pain! As she told me, I couldn't help it! Tears came to my eyes, partially remembering the pain I went through when I lost 45 pounds, but mostly because I was so sorry for her. I knew that pain! All at once, many years ago, (but not enough years so that I've forgotten) in three months time, I lost my husband, my Mother, my Grandmother, and (don't laugh) 11 chickens and my 19 year old cat. Yes. I knew that pain! Ever since listening to her story, I've been trying to think of something I could do for this woman that I don't know, but in passing. How can I help her heal? What could I do but pray? I'm still helpless, but God will answer this prayer, too. I know He will! When I get to feeling sorry for myself, (and I do!) I ask for healing, and sure enough I receive it! It's not always in the form that I ask, but it is always in the form that is best for me. I trust in God to know what's best for me, and often or most always... it's in attitude! It takes a while for me to understand, and sometimes I never understand! But, I know that He is in my life, guiding me, and helping me. I have marfan syndrome, and yes, the physical symptoms are a real drag, but I'd far rather have heart surgery, or lose my eyesight, than to again go through the pain I felt through the losses this young woman is facing, right now. So, don't you see? I am so lucky! There are far worse things than marfan syndrome! I see things happening around me to otherwise perfectly physically healthy people. Every one of us is going to have terrible sadness in their lives. Even the most beautiful girl in the cheerleading outfit in high school... Even the most handsome young executive, who seems to have it all! We tend to look at these otherwise 'beautiful' people, and wonder what it's like to be so blessed, but they too, will suffer far worse than those with any physical disability. As for me and my life? I'd choose an aortic dissection any day- over the pain that heartbreak can cause! Pray with me, for this girl in the store that has so much on her plate! Right now, she is far more disabled and in far more pain than any of us with physical challenges. The neato thing is that she'll probably come out of it so much stronger, and will be able to help others going through the same thing! It's a chain and we all learn and then we help others! And let's remember the most important things in our lives, when we look over to those that seem to have far more or far less than we do. We are all in this, together. You know, I read the board sometimes, and I wonder why people argue with each other, when our love for fishing and for salmon and for our rivers is all the same. three o'clock every afternoon and then lay down with our blankies for a nap. Or if all governments had a basic policy to always put thing back where they found them and to clean up their own mess. are - when you go out into the world, it is best to hold hands and stick together. I'm grateful, in this sunshine, today, that I was able to put yet another month on my journal. I mean, what more can I ask for? Please remember... when you post on the board, the rules for life, written above. At ifish.net, we are all in this, together! Oh, my gosh! If today isn't the day that the Lord hath made, I don't know what is! It's luscious! I want to sink my teeth into it! I can't live it, fully enough! Can you imagine Heaven being a more beautiful place than this? Amazing. I can't conceive of it! I came home from Portland this morning, and even Portland was gorgeous! The Steelheader's Banquet was awesome as usual. That is my favorite banquet, and likewise, my favorite group of Fishermen. I came home with the gift of a vial of Willie's ashes. The idea is to take him fishing and hunting. Willie himself, picked out the vials. Buzz explained it, as he tried to retain his composure. Buzz and Willie were so close. Then, as Loretta Erickson and family stood to honor Jim Erickson, tears fell again. So many people at that banquet that move me to tears. So many lives lived to the fullest. I love those people! Oh! And Rhonda Shelby was the guest host and she did the most remarkable job! What an absolutely gorgeous woman, Rhonda Shelby is. And what a wonderful sportswoman! She is so pretty on television, but up close, she is stunningly gorgeous. Take-your-breath away, gorgeous! Her skin is so flawless. It doesn't stop there, though, she's as kind and caring as she can be. When I grow up, I wanna be like her. :) Oh, wait! I'm already growed-up past her! :) but, I was so excited to get to talk with her, again! She's just neat-o! Bill and I decided we didn't have it in us to drive home, last night, so we stayed over. As we neared the Kilchis river canyon, things became more and more DisneyWorld-like! Walt Disney has nothing on us, when it comes to Spring time in Oregon! Bright green mosses popping out of a glacial river, roaring strong with snow melt! Drift boats with bare armed fishermen, laughing in the sunshine, boats stacked up 8 deep in some holes! Bill and I giggled as he snarled, "Darn internet, anyhow!" The boat trailers were thick at the Sollie ramp! In April! Used to be that the commotion stopped around February. Darn internet is right! Those darn people should be home and inside closed doors in the dark, stuck in front of their Nintendo! Right? Hey! If the 'darned internet' makes this kind of change, I'm all for the darned thing! As the car hummed down the road, sunlight streamed through the trees, and lit up the rear ends of a stand of elk, hiding in the forest. Hiding! Ha! I could see them 1/2 mile away! And here cars zoom by at 65, not even noticing! Yikes! I got a new pair of prescription sunglasses. I don't know if it is that which makes the world so beautiful, or if it just is! Finally home (sweet home!) Bill parked the car in our lot, and we opened the door to two wonderfully happy puppies, yelping "Rarr rarr rarrr rarr!" Waggling tails and wiggling bodies! Happy! Happy! The world is a good place! 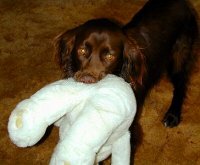 Kilchis searched out his stuffed bunny, and paraded it around for all to appreciate. But then-- I walked down to the river, and inhaled the most lush, wonderful air! Thick with Spring scents, heavy flowered trees, and moist nearly- melting-in the sunshine mosses. Talk about dizzy! My senses are on overload! Tiny shoots of new growth popped out, everywhere, as if before my very eyes! I had to take my shoes off! Tender foliage poked up in between my bare toes. I had to feel it! I have so waited for Spring that I wanted to roll in it, actually! Clumps of moss were unearthed by animals that tracked before us. I bent over to investigate and the earth let off an explosion of musky and deep moldy scents. We live here. We are going to grow old, here. Here in this beautiful home by the river, where the seasons bring new surprises, each year! Each day! How earthy old people become --moldy as the grave! Their wisdom smacks of the earth. There is no foretaste of immortality in it. They remind me of earthworms and mole crickets. I love that! I have to get out some Thoreau today, and go read on the porch in the sun! Watch the trees sway in the afternoon winds. Watch! Carefully, before the rains ascend on us, again! Yikes! That's what makes Oregon Spring so awesome, though! We don't get it every day! It's a gift! Nothing... I mean nothing is more beautiful than Oregon on a sunshiny, Spring day! I've got to get out from behind this screen and live the life that we are gifted! Walk the talk, so to speak! I had to come check out ifish, but not for long! You all shouldn't be here, either! Get outside! My brain is absolutely on overload, and my name? I can't remember the darned thing! Time to work and to pray. -and then? Today we need to start with something simple. OK... Now, we move onto hot coffee. Got it. I have a migraine. I can't get rid of the darned thing, and I think I know how to get rid of it, but I don't know where and how to start. Last night I prayed on my knees. "Ifish is too big for my britches, Lord." It is. It really, really is. I have so many things on my plate to do, so many ideas, so many necessities. Some problems, lots of good things, but I don't know where to start. In my prayers, usually, I start with my blessings and thanks. But, last night, I started with my worries. Sometimes I wake up in the morning, and it's all good things on my mind. Sometimes I wake up and the problems hit me square in the face, and block the way for anything good. Today is that day. Why didn't God take away my worries? I think it's because I have work to do. Or, maybe it's because I didn't start my prayers with my blessings! I won't go in to what worries me specifically, but it just involves all the things that businesses need to do, to be a business. Often, and especially lately, I think it is all too much for me, and that I'd just like to go fishing more. I think that's what bothers me most. I am only able to work a little bit, and it's not enough to cover all the bases necessary for running a business that is getting bigger than I can handle. That leaves me no time left over to fish or relax. By the time I'm done, I'm done and have to be resting. The limited energy that I have is now mostly spent on ifish.net. I haven't been in a drift boat all year. I haven't been on vacation in 11 years! I have a vacation planned starting on Sunday, but how can I "vacation" when my mind is going a zillion miles an hour with things needing to be done? Even if I'm physically away on vacation, I can guarantee you this. My mind will be ifishing! My only plan to escape this is to pray, and to take a stack of index cards and write down every ifish thought or thing to do, while I'm gone, and just file it. When I get home, I will try to sort through them. Those with time limits will be dealt with first. Others can wait. That way, at least I can put them away. (I hope!) Maybe I'll start today, so that if anything needs to be done absolutely, I can do it before I go? But you want to know the funny part? Even if I wanted to quit ifish, that would be more difficult than keeping going! And frankly, that is part of the reason ifish.net still exists! I can't tell you the number of times I've gone to bed in tears, wanting to quit. But, I can't! I am working for you. Not only that, but Ifish.net has people who have invested in banner ads and those ads extend out a ways. We have to keep renewing those, in order to pay the bills to keep it running long enough to expire contracts. LOL! Heeelp! Do you see the wheel go round? It is spinning so fast that I can't get off! I am forced to think, "So what if I just expired? What if the merry-go-round got going so fast that it throws me and I'm no where to be found? What if I became so disabled that I was not able to run ifish?" I need to think of it in those terms, and plan for that, as it will happen, one day. Of this, I am sure! I have done some planning in this regard. Before my aortic dissection, that didn't seem as real, but after that, I had to think in those terms and plan a will. We all should think like that! But, are we ever so sure that our wills aptly covers our current concerns? Life and times are ever changing. So, I need to plan my estate again and again, which is complicated further by my disabled status. Argh. Having ifish.net is kind of like parenting. It's a darn good thing that I love this place like a child. Ifish.net is my baby. Sunshine is my prozac. :) The last few days of sunshine, my problems seemed far away! But, today when the clouds and the rain cover the sunshine... Today, I'm lost in confusion and thought... when it rains like this, sometimes I fall into a depth of despair and everything falls on my plate at once. But, still? It is in these times (and all times!) that I need to hand over my problems to my Heavenly Father and not keep taking them back because they are all too much for me! My Heavenly Sunshine- My Heavenly Prozac! Of course He gave me brains to think, and I am responsible to do what I need to do. Work is a good thing, and my Father rewards me for that, but worry is not! Worry is a sin! What a relief to know that worry is not good, and to quit it! After I do what I am able to do, I can go fishing! And I can go on vacation! Who are you? What are you all about? What are your favorite things? What drives you? What are you after? I've been thinking about this, lately. Mine is definitely comfort. I live for comfort! My favorite things are things like slipping into fresh flannel sheets, laying my head in a bundle of soft pillows! I love to soak in a hot bubble bath that smells wonderful. I have a whole basket of different ones, and it's a delight to get to choose which one at night! Lululemon athletic clothes that are soft and feel good to wear! There is nothing better than their "Remix" sweatshirt! That's my downfall! Don't ever go there with a credit card! Oh! How bout thick Danner socks to warm your feet? Or take them off and slip into some Uggs boots, barefoot! Soft, cozy blankets! Comfort food! Mashed potatoes and gravy! All of these things that I love represent the one thing I'm after in life... comfort! That's me! It even extends to the people that I like surrounding me. People that make me feel comfortable! How is it that I like all of the comfortable things in life, but then I crave the things that flip me into the wild side? I believe we should do something that scares us, at least once a day! But, you must have comfort to come home to! Ifish makes me comfortable. But as it grows, it's growing to the wild side! It's nice to be able to come home to the mod squad, after a day of reading the wild stuff that is out there, lately! The mod board, (where we discuss ifish problems) has clearly become my family and my comfort zone. It is funny, though... because the mod board can be extremely wild, too. Yesterday I introduced a new mod and said, "Welcome to the mod board! Where the sky falls, every day!" Maybe it's all about balance. Some folks don't need the extremes, but I think I do. The wilder, the better, and the more comfortable, the best! You can almost tell if I'm doing well by how much I write. I write most when I am well. I also become more well, when I write! So, I am well. I am especially well because Red is still alive! She doesn't sound well, but she is alive! Red is my five year old Rhode Island Red. Bill and I took turns sitting with her, watching television, wrapped in a towel. Her breaths were awful rasps coming out of her, and once that happens, you are usually too late. We may still be, but seems like chickens go so fast, once they are ill. Red "wasn't right" and just stood around about 10 days ago. We treated the chicken water with antibiotics, and then left them be. She got better, but then she became really ill, two days ago. Since then, we've separated her, and treated her with more direct antibiotics. Bill and I don't sleep well when one of ours is ill. We make several trips downstairs in the night to check on her. We toss, we turn, we wake anxious. We sleep fitfully. The one up first, yells out the state of her health. Last night, I didn't do well sleeping, at all! I thought sure she would go, overnight. She didn't! Yay! There is time to force feed her and get her more medicine. Oh, I hope she doesn't go. She's such a friendly girl. Ifish member Freespool told me about these neat and very friendly chickens called Barnevelders. Since then, I've been searching and we finally found a breeder. I guess they are very popular and they can't keep them in stock. We have a nice lady trying to get us some, this summer! I can't wait! They are supposed to be really friendly, and they like to follow you around the gardens. :) Fun! Our usual flock of a bakers dozen is down to 8, now. Our first chickens, that are now nearly 10 years old, are slowly dying off. I miss them so much! Although they've lived a wonderful life, it's never easy to let go. We have a beautiful grave site for all of our family members, and the chickens are buried with their own little metal inscribed cross above them. We have a bench to sit on beside their graves. It's lovely there and Bill and I visit often. Well, I leave in three days. Two, if you count the leg to Portland. I am becoming nervous. I pet my beloved Kilchis at night, laying in bed, wondering how I'll do, being gone this long. I tell Bill how much I'll miss Kilchis, and feel badly because I'm not fussing over him. But, Bill understands where I am, and that I'll come home. My dog won't. It breaks my heart to leave Kilchis. He worries when I'm gone and isn't himself and after I get home, it takes days before he's himself, again. Bill doesn't give treats to Rev and Kilchy like I do, in the morning. I have fun and it's a huge ritual. I might choose two chicken jerkies, one beef, (tastes change from day to day!) one dog cookie, and well? Just too much, really! I tend to the dogs before anything in the AM. The dogs line up, wagging their tails as I hand them out, one by one. Bill goes to get his newspaper and sometimes reads it before he even pays attention to the dogs. Then, he may throw them a cookie and calls it good. Not nearly so fun, huh, dogs? I spoil my dogs rotten, and that's just the way I like them! I still have my ear infection, or whatever it is, and I'm kind of worried about flying. I took Andrew on a plane once, when he had an ear infection and believe me, it wasn't fun! I hope I don't get to find out why! I had to close down guns for sale listings on ifish.net this week. Frustrating, as I had just made a hunting classified! Today is the day I'm removing them from all ads. I'm not happy about it and when I get home, I am going to work on gathering a committee of interested parties to help me bring them back. Interesting how many nasty grams I get, when I have to make difficult choices about our community in order to save it. But, when it comes time to help make things happen, those same people can't be found. I can't do this all by myself, anymore. I need the help of the community. So, if you want to trade guns on ifish, you'd better let me know! Send me a note if you'd like to help with decisions. Ideas so far are having members be from Oregon only, have at least 100 posts and help ifish find the appropriate liability insurance to cover us, if something were to happen. Join us! We can make this happen if you truly want it, but I can't do it alone! Well, I have to get this house clean, and give Red her medicine. Pray for Red. She needs your prayer! It truly will be a miracle if she survives. Nursing chickens back to health just doesn't work well, usually! Well, who woulda thought that Bill and I could save a chicken's life? It's been a long road, actually. Many hours in front of the television with a chicken in our lap. Running, every time she made a sound. "Is she OK? "How's Red, now?" "Could you check on Red?" Argh! Sometimes I'll get brave and give her a whole dropper full, if I can get down behind the little hole that they breath through. It's not easy! At all! She is living in the dog kennel. So, that means changing bedding a bunch! She hasn't eaten or drank for almost five days, unless it was via us. But, today? She did! On her own! She's not out of the woods, yet, but it's looking good! It's not easy to save a chicken! They go so fast! We've called the vet multiple times. One said, "Just how much do you want this chicken to live?" What do I say? A hundred bucks worth?? Do I hear 200? Hmmm... Bill? Got 200? So far she's only cost me a bottle of Pedialyte, some yogurt, and a tiny piece of a pill of Diflucan. After tons of google searches, I find something I think she had. It's called "Sour crop" or something. We thought she had a cold, but this morning she burped and it smelled so gross! That was the key! It's sour crop, alright! That's where they get something caught in their crop and it won't digest. So, all day today, I've been massaging a chicken's crop! LOL. Bill was gone to the fin clipping, but I had to pack. So, in between, I've been massaging crop! I keep giggling, but that's what! Plus, yogurt and olive oil with a syringe. Finally, she gave out this huge burp! (Ever hear a chicken burp? I hadn't!) and she's better! I feel like Dr. Chicken! She's much more alert!She's so darn cute! Looks around sideways, sitting on Bill's lap eating yogurt! I love her! I hope she makes it! Tomorrow I leave... for vacation! Wow! I need to learn how to be a big girl. Saying goodbye to Kilchis is really hard for me. Imagining being gone from him for this long, even harder. Funny, though. Tammy and I have been e mailing back and forth about the trip, and laughing. Al ll that we want to do is making the schedule a bit hectic. She wrote me that she was hoping that one of the nights we could get a bottle of wine and a movie and snacks, and sit around and giggle and talk like when we were in high school. I returned e mail with "But... I thought we were doing that every night?" She laughed, but said she doesn't think she can handle wine, every night. Well, neither can I! The funniest part is that neither one of us are drinkers, but geez louise, we can do the movie and giggle part! I hug Kilchis at night, while I watch television or read, and pet his soft fur. I whisper sweet nothings into the soft spot behind his ear and rub my cheek against that silky fur. I love that dog SO much. I'm going to miss him so much! He's my shadow, and when I wake in the morning, I'll not know what to do without my routine. We wag tails and head downstairs to the treat cupboard, together. Kilchis, Rev and I. Bill giggles at how happy the dogs and I are together. Mornings truly are the happiest time of day. I give them one treat, go get my coffee, and wait for them by my computer. I divvy up the goods, and hand them out, one to Rev, one to Kilchis, and thoroughly enjoy their excitement. It's always so lonely in a motel, without them! I'm really kind of scared that I'm going to get homesick. Homesick for the dogs, the river, the routine. But, I have to do this! I have to do it to have time to think, time to not do ifish, time to giggle with my girlfriend! When I get home, I'm going to appreciate everything that I have so much more. I do wonder, though, how can that be possible? I'm sitting here, just at the thought of leaving, with my heart full of appreciation! This morning I don't want to go so much. :( I'm homesick, before I even leave! I wonder why I even dreamt this up! Am I crazy? Leave my Kilchymancuteso? It just bugs me because he doesn't understand that I'll be back! And Bill doesn't believe in giving them near so many treats. Poor, poor dog! LOL. When I get home... Kilchis and I are going to open a bottle of wine and watch movies and rough house and giggle all night. I can't wait! Kilchis doesn't drink, but then... neither do I! I asked my doctor if I could go on Space Mountain the ride, at Disneyland. He didn't know and didn't feel comfortable saying. He said, "Ask your cardio." 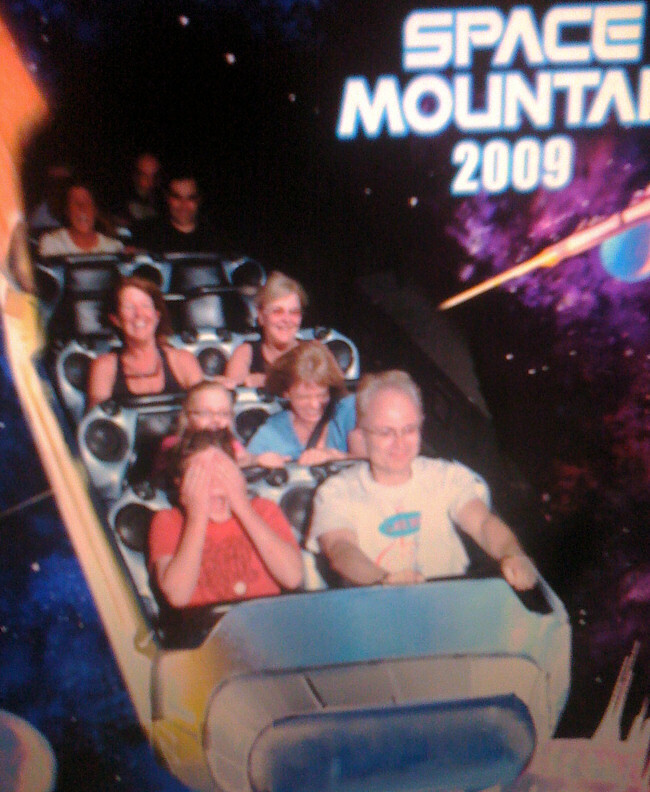 I asked my cardio doctor if I could go on Space Mountain. He didn't know and didn't feel comfortable saying. He said, "Ask your surgeon." I asked my surgeon if I could go on Space Mountain. He didn't know and didn't feel comfortable saying. I said, "Off the record." He said, "Jennie. I didn't spend 13 hours gluing up your innards for nothing. Have a great time!" I said, "I can go on the rides? What about splash mountain? What about upside down ones?" I said, "How bout Andrew?" I talked to my doctor, and he laughed and said... "You kind of have to pick your poison, but have fun!" He lives within my heart!!! Funny, though. Tammy and I have been e mailing back and forth about the trip, and laughing. All that we want to do is making the schedule a bit hectic. She wrote me that she was hoping that one of the nights we could get a bottle of wine and a movie and snacks, and sit around and giggle and talk like when we were in high school. I returned e mail with "But... I thought we were doing that every night?" She laughed, but said she doesn't think she can handle wine, every night. Well, neither can I! The funniest part is that neither one of us are drinkers, but geez louise, we can do the movie and giggle part! It's been an interesting run, this Palm Springs trip. Fun, but kinda busier than I'd have thought. The day we were going to go to Disneyland the winds were blowing 70 and they closed the 10. Funny, how they call all their interstates "the" instead of like us, "I". I'll never forget once upon a moon, driving from Glendale to Palm Springs during a dust storm like the one we had, this week. It was also blowing 70, and the mp markers were flat to the ground. The sand, so thick we couldn't see to drive. I guess we had a historical storm, this week, and I flat out remember, and was here for the last one in the 70's! Weird, because I don't frequent California all that often! Both times, I brought our Oregon Coastal winds with me! I'm sorry! Tammy and I had envisioned warmth, sunshine, and getting out of the Oregon cold. Not to be, until now. Yesterday was the first pleasant and warm day. We lounged, drinking virgin pina coladas (yes, with umbrellas!) Yum. I have a pinkish glow to my skin and it feels good! Last night we took the boys out to Coachella. It was exciting! Paul McCartney was doing sound testing with "The Long and Winding Road". It made me cry. The boys were so excited! They bought a cheapo tent to camp for the weekend and after Tammy and I left, they got out their paints and brushes and started to paint it! I guess the whole crowd of neighbors joined in. I can't wait to see a picture of it! Fun! Oddly enough, David (the usually math minded) has become interested in art and painting. He spent the previous days sitting in the shade, painting. He takes his brushes, acrylics and art pad with him, everywhere. That, and a stack of 14 or so books. How he lugs it all around, I have no idea! The Coachella Festival is a hippy commune like Woodstock, and everyone seemed very friendly. I was tempted to join the kids! But, Tammy and I took a picture of the boys (much to their chagrin?) and waved goodbye. They were very good about it,. Back in the day, if my Mom had done that, I'd have died of embarrassment! The internet here is hit and miss. I will try to upload this, and then write more, later. I need coffee! Oh! One last, Tammy discovered a dove sitting on a nest, right above our heads as we sit on the deck. It's fun to watch. She's so cute! Francis' column is up! Read it here! Chapter Eight of Salmon on My Mind! I skidded sideways into our driveway. Andrew and I flung the doors of the car open and half limped from exhaustion, and half ran for the door, he yelling, "kitty!" and I, "Kilchis!!!!" Nothing weirder looking than two marfan subjects, limbs flying, trying to get to the door, first! We couldn't get there fast enough! We were rewarded with very happy animals! Oh! And Bill was happy, too! Fur flying, we all greeted one another with total enthusiasm! Kilchis had his bunny to greet me with, and kitty was so happy and full of purrs for Andrew and I. Yesterday? Not so much. We were the victims of an Alaska Airlines blunder. Our flights were cancelled. Man, oh man... We rose at my Dad's house at 7 after a late night in the pool, just to get to Ontario in time to check in the car, and get through security, all for nothing. They cancelled the flight. They were going to ship us over to Orange airport, but with no guarantees we'd make it in traffic, we opted to stay in Ontario and go out on the 5:00 Pm flight. Thing is, that put me too late to drive home in daylight, and I can't drive over the pass at night. We landed at dusk and I had to shoot over to the closest hotel and wait out the dark hours until first light. Just at daylight and not a minute later, we got in the car and drove home. Both of us couldn't wait a minute longer, either. We could not wait to hit the garage door opener at Kilchis River Road! It's so odd. Not a goldfinch to be seen, yet. Not only that, but not one steelhead redd in the river! The dogs and I went to check it out, first thing. They showed me, "Mom, look? No redds!" Weird! Strange year, it is. No apple blossoms on the trees, either! It's cold, here! It was over 100 when we left. I really enjoyed myself, and frankly, the camel on the ifish's back is breaking a bit. I simply can't go on much longer, and I am going to have to have help, and help, big time. I'm tired, you guys. This is a big operation, and the mods are holding us up. It's not fair to them, and it's not fair to you. I need for ifish to remain fun for me in order to continue, and it's getting too big for me. I'm stressed running it myself. I'm looking to find someone that wants to run it so that I can do what I do best. Write this column, engage in ifish discussions, and FISH! I have to find someone that can do this kind of thing to replace me, and that's not going to be easy. I refuse to make ifish a cash machine. At the same time, I know I can't find anyone to do ifish for what I do it for, because ifish is MY baby, and I run it for love. I don't know what it is, but somehow people want money for working. (Isn't that odd? LOL) I have run ifish for almost 12 years, now, and I have paid myself barely over the ifish expenses. So, pray. I know there is an answer, somewhere.... but I do know that my health isn't getting any better, and I want to live while the living is good and sadly, fish, while we still have some! I had fun. I really, really did. I went to Disney! I lay in the sun! I didn't cook! I spent time with my boys and my friend, Tammy! I had a spa! I got my toenails painted! I am tan and happy and I cringe when I think of not fishing for springers, now, and instead, spending the limited energy that I have behind a keyboard. Soon, I will have to change the site name to "iusedtofish.net" unless I get out there to have something to write about here besides what I didn't fish for again! Thoughts have run through my mind... I can rent a mobile home and hit the road. "Where's Jennie fishing, now?" Tammy and I giggled about that plan as we dreamed our dreams by the poolside. I could run ifish from a satellite disk attached to the top! Wouldn't that be a gas? LOL! Thelma and Louise, fishing the coast! We were a wild pair, we were! I could do that! I can do anything! Life is so short, and I want to live it up! As ifish has grown, I am to be found more and more behind this computer screen instead of actually fishing. I want to say to people that I meet, "I fish! I love to fish! 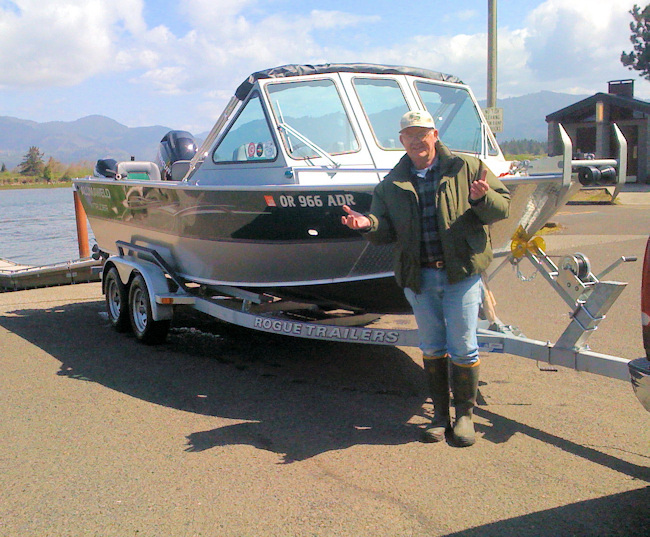 And just to prove it, I have a site on the internet where I tell you about my fishing! I haven't been in a boat for over a year. That, my friends... HAS to change. I'm serious! With the good Lord's guidance, once again, there will be the real, true, ifish.net again, and not just Jennie wading in e mails, behind the scenes. Let someone else do the books, the billing, the marketing, the gun sales, the moderating.... Ijustwannafish.net!!! There is an answer, but it's going to have to come from my Heavenly Father because it's going to be a miracle if it happens! Or, maybe I am meant to keep it up. Who really knows? But there is an answer, and In His Time... I will fish again! I really want to talk about my trip, before it's too late and I forget! But, man oh man, Ifish keeps me busy! Too busy! The first day of our trip.. well, actually, the day before, I made certain to have my eye on David-the-casual. He has a very casual attitude towards everything. Part of me wishes I could be so relaxed, but another part worries about whether he'll make it places on time! I just didn't want to worry about him making it to the Airport on time, via Max. So, I had him Max it to the hotel at the airport, the night before. I can't drive at night, so I had to go the night before. I dropped Andrew off at David's house in the afternoon, so they could go together, and also do a little downtown fun, beforehand. They arrived in good time, before 10:00 PM. Pretty soon, however, I heard doors shutting and whispering going on. Sure enough, David enters the room, and meekly says, "Mom, can I borrow your car keys?" "I forgot to get Andrew's glasses when he asked me to. We left them at my house. ARgh! Boys! LOL. So, I stayed up into the wee hours of the night, waiting and worrying for my son to get back to the hotel with the glasses. He doesn't know Portland roads. I sent him with the GPS. He made it back by midnight, but grrr... I wanted more sleep than that! Oh! Guess who showed up the day after I got home? Every day I asked Bill via the phone, "Have the goldfinch showed up yet? The grosbeak?" Every day, the answer was no. But the day after I got home a whole flock of goldfinch hit my feeder! They waited for me! This brought a huge smile to my face when I looked out to see them! Even as I look out my window, right now, a buttery yellow flock of little birds cover my tube feeder! I love it! They are here for the summer! But, why is it so darned cold out? And so, our flight took off as scheduled, and was uneventful. The car rental went fine, also. Everything was groovin' along and we arrived in Palm Springs. We dropped the kids off at the Shilo, where I had some free nights for them. It was a beautiful property. Rich and lush, with flowers all around! The boys had a poolside room, which they were tickled about. David brought his paintbrushes and books and spent most of his time reading and painting. I gave him a few tips on doing washes for the background. He had no clue! He just goes for it, and does well, at that! I had no idea he was so creative that way! Here I am in the parking lot of the Shilo, with the mountains and snow, behind me. Those mountains look so close! Are they deceiving, or are they close? 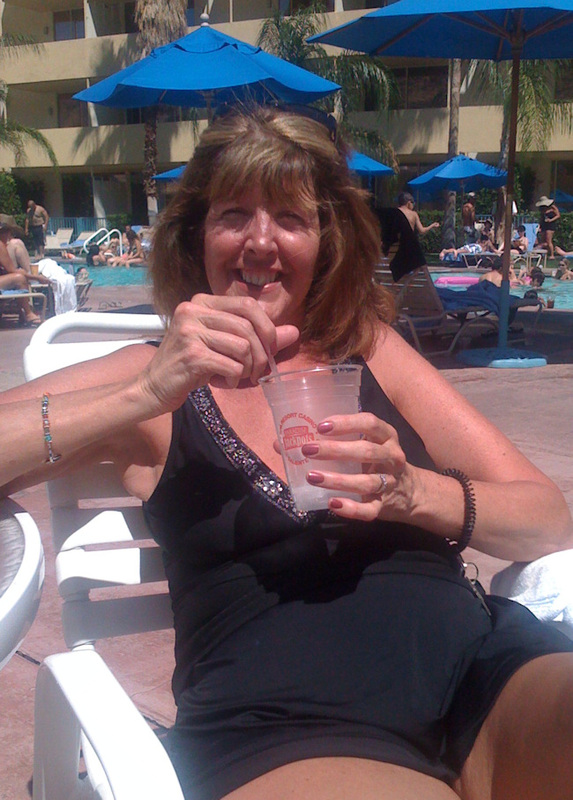 Tammy and I continued onto the Palm Springs Hilton, a ways down the street, where we landed a pretty good deal. Too bad we couldn't all stay together, but we did get together each breakfast and dinner, and sometimes played during the days. The time just flew! Deli & Bakery. That is the greatest place to eat! We all gained a couple pounds with their wonderful eats! Their latkes are wonderful! We noticed the wind picking up, and before long we had a full blown storm on our hands. Desert wind storms can be very harsh. I remember back in 1970, I was in Palm Springs doing a concert with Nancy Chatalas Olson, and my girlfriend drove from Glendale to come to visit. I was playing at a place called "Marios" I think... Anyhow, she ran into a dust storm from one of these freak "historical" storms and it was awful. Interesting that every time I come from Oregon, I bring the winds with me! This storm blew up a 72 MPH gust. It was really interesting, but so cold! Our goal with Palm Springs was to get warm, and we spent two days huddled in our room, freezing! LOL. Even so, we had a great time, talking, giggling, and eating too much with the boys. There were little sparrows and doves to watch, and every day Tammy bought a muffin to feed them. Pretty soon, she found this in the brush, next to our room. 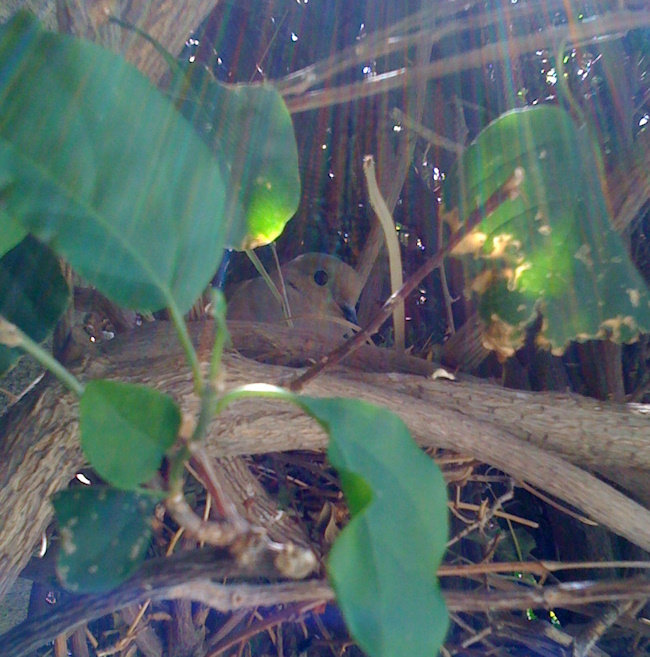 Can you find the dove on the nest? Anyhow, we just had a great time, regardless. Vacation is wonderful! I had forgotten just how wonderful life can be! Soon, the sun came out, and we were enjoying foo foo virgin drinks with umbrellas in them, and letting the sun sink into our skin. It's a real hoot to pick fresh lemons off trees! I love that, and they are so pretty, so big, so intense! I'll write about the rest of our trip. Coming up... Jennie and Tammy go to see Mickey Mouse! My sides still hurt from laughing and screaming so much. I really, really want to thank Dr. Song for giving me the confidence and permission to have fun at Disneyland! I never, ever thought I could do this, again! I did! I did! Now, this is living! Yo, ho, Yo, ho, A pirates life for me! I've been singing that since I was there. I love love, love the Pirates of the Caribbean ride! I think I've been on that ride 100 times, but I still love it! Peter Pan, too! So many, many more, too! Oops! I keep laughing about this and I have to share. OK, get this. It was a busy day, the day we left. Got up really early in order to drive to Ontario, return our car and catch our flight. Turns out, the flight was cancelled, but never mind that. Once to the car place, Andrew kept staring at me. We were laughing about something, anyhow, but he looked and said, "Mom? You look weird!" "You have a big bump on your upper back on one side!" I investigated, and then just broke out laughing! I got dressed, sideways! LOOK! The padded side does NOT go on your back! LOL Hey! I got it half right! Bad posture, or my shirt on sideways? How embarrassing! I mean, look at the front! I mean the back! I mean both! A little lopsided, Jen? Where had I been, looking like this? Sheesh! I had to run into the ladies room and twist it around! It's one of those new fangled shirts with the cross back and I got confused in the early morning, lacking caffeine! LOL I laughed so hard, I couldn't stand up, straight. I'm still laughing! Now, below is the happy, warm, all together Jennie that knows how to wear clothes the right way. This is at the Palm Resort Spa where Tammy indulged in a mud wrap, and I, in a pedi-manicure. We both did the "Taking of the Waters". It was wonderful! We lay in the sun, then went in and took mineral steam and mineral baths! Then, they'd take us into this quiet room to lay down and listen to mystical Indian music! It was wonderful! They would cover our eyes with cool lemon soaked cotton. Ah... More! More! 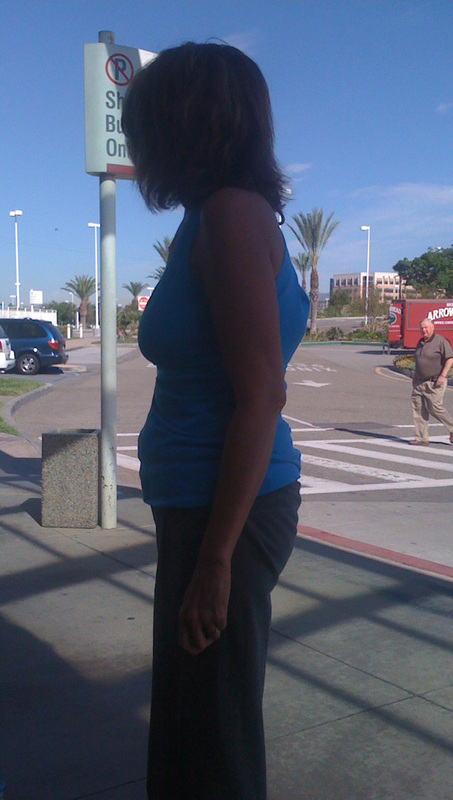 I miss, so much... the tropical warmth of California Deserts, the sun on my skin, and vacation in general! drinking foo-foo drinks with umbrellas in them! Guess who missed me, though? There is no place like the river. It's what calls me on a bad day, or brings me out to celebrate. Bill and I keep two old plastic woven patio chairs that we keep secured in the bushes. We gather together on the sandy beach to rest and let the dogs dig and run after a hard day. When the wind is forecast to blow, or the river to rise, we yell, "The chairs!" and hurry to secure them. They aren't expensive chairs, but they are valuable by way of memories. Molly the cat thinks so, too. She hides under the chairs when the dogs get too wild. The river is where I go to do my yoga stretches as the sun rises. Sometimes I plug in my headphones and sing along to jazz. I've been known to dance on the sands when no one is around. The river brings me peace, and can flip a bad day over and right it, without effort. In all my days of living by this beautiful stream of water, it's never changed a good day. Only enhanced it, only improved it. But, it can sure improve a bad one. Just by stumbling over rocks as I walk, my mood lifts. Just by searching through millions of grey and black rocks for crystals, my burdens are lighter. It's like I leave tiny bits of bad behind, with every step. If I walk long enough, I can leave it all behind. The river's orchestra, whether it be full and roaring, blocking all other sound, or tiny and trickling, accompanies perfectly the things that I like to hear. Ablerti bass to a blackbird, or trickles of high notes gracing over my 'hilarious' bird. My hilarious bird is a dipper that sings like a lyric coloratura soprano, the most joyful song with perfect the timbre! It makes me laugh along every time! Did it go to the Juliard school of bird music? It must have! There are deeper rushes of feeling that hit me when the frogs gather at dusk, or the coyotes, nose up to the sky, call out to who knows what! I love to sit as the sun goes down and watch the river otters at play. Whole families come out to slide down the rocks, or splash in the pools. There is nothing more entertaining! Sometimes, I'll see a beaver slog through the frog water, headed for home. It's a long way home... at that rate. They get the river full time. Are they happy all that time? Surely, there must be bad that happens to them, that make them appreciate so much, their fun times? I suppose Nature is a cruel Mother to them. I suppose... I just don't see that part. I just came from the river. It's been a long, hard day. I felt so hopeless and so tired before my walk. But, there is nothing better than the river. Nothing finer than the sun going down, the trees shadows growing longer, stretching on the mirrored surface, until the slate turns flat and dark. In the dusk, it's just myself, Kilchis, and Rev, sitting there, silent. The other animals know that it's time to go to bed. An owl warns us to goooooooo. The river now belongs to the night animals. Then, we get up and walk, and even in the dark, we know our way. The way of the river.. The Kilchis river. The river that has mended my soul. Mended so many heartbreaks and healed so many hurts. And this is where He speaks to me, so loud and so clear. I love it when I wake up and you can smell, see, feel and even taste spring! Mostly, the sound of morning birds are what thrill me, but it's also just the feel of the chill air. But, it's not cold! It's rich and cool and refreshing! It's the kind that you can tell will warm up, later! When my ears are flooded with this type of morning, I think back to sleeping out overnight with my brothers and sisters underneath the back patio. Soggy, dew covered sleeping bags that would later be warmed by the sun. We'd return to them later in the afternoon and nap in the pile of warm bedding. But, snuggling deep under them in the morning, I knew that we'd have to cross the cold, wet lawn in bare feet as we raced into the warm house. I always got up early. Sleeping in after sleeping out just wasn't possible. Too much bird racket! Or the thought of having to get on the berry bus to go pick berries! Ugh! How can that bad memory now be a good one? Makes me giggle. There is that bird! What in the world is it? I hear it every year! It sings this mournful tune. High C, down a whole step to B and then F#! What is it? I'm going to have to go listen to bird recordings until I figure that out! Grosbeak? White crowned sparrow? What!? We may go clamming this morning. What a great day for that! I guess the tide is kind of late. I hope we are not too late. Clamming was excellent a couple days back. Did we wait too long? It's so hard to go anywhere or do anything with ifish, lately. It's a full time worry, even if it's not active work. Yesterday, alone, I had nearly 10 people interested in advertising. That's great news, but how do I choose who? I don't have the time/energy/space to place them all. That's why I am praying for help, lately. It's my biggest prayer on my prayer list. Lord, I need help with ifish. It's too big for my britches, and I'm ready to do far less. Far, far less. It's too much stress for me. Just like my Heavenly Father does, he's answered my prayers with several options, but He expects me to use my brain to figure out the answer. Hmph! I've always been one to want large billboards with "Jennie... This is the Lord..." on them, with the answer, underneath. Tricky of Him, isn't it? To go ahead and do that for me, fully knowing that I have poor eyesight?! The answer is there, but I can't see it! More prayer, Lord! I need more help! It's a good thing he has confidence in my choices, because I sure don't! I guess I will know it, when I find it. I've always known that in my life, I wanted a career. I wanted to be successfully, fully responsible for myself, and able to care for myself. Now that I have it, though, I realize the cost on my life. There is always a cost. Now I know that I want some time to actually enjoy my life, again. I want time to fish, to be with my children, time to travel and see the world. Is there ever enough time in our lives to have it all? I believe so... It's just that the best part comes once we get to Heaven! Oh! I forgot to note-- Yesterday I was out on the river and it was really low. I walked along with just Kilchis and I, searching out into the river for what I thought I would not find, this year. Steelhead spawning! And there they were! Finally! I've never seen them begin this late! Four beautiful swishing tailed steelhead in the shallows! Their tails, interrupting the flat shallows, as they raced ahead and below the cleared lighter gravel where the hen dug. I was so thrilled! Finally! Finally! I went back to the house to get a cup of coffee and a snack. Bill had gone to Salem to pick up Traeger pellets. I called him on the phone, excitedly to tell him of my find. I told him to join me, when he got home. I drug the beach chairs to the spot where I could see best. It was a wonderful spot. A sandy beach, surrounded by trees and brush that perfectly camouflaged my presence. By the time I got back, though, they weren't active. But, I waited and waited and sure enough, they came back! I was entertained by them for an hour, at least! I can't wait to go back, really soon! I so wish you could watch, too! Better than television, anyday! It's the Discovery Channel, right here at home!